Ghost Story TV and Horror Realm in conjunction with Shadow 3 Media and The Hollywood Theater are pleased to announce BEYOND THE PARANORMAL, an ongoing informational/educational lecture series which will examine the latest information, theories and science practices which delve into the mysterious world of the paranormal. Check out the promo below! Each event will feature noted guest speakers from around the country whose work and significant contributions are helping lead to a better understanding of the scientific and spiritual aspects of the world of the paranormal. 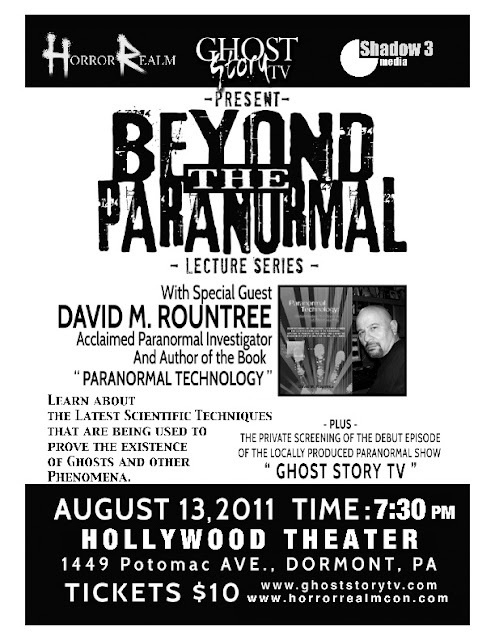 The first event will take place at The Hollywood Theater in Dormont, PA on Saturday evening, August 13th at 7:30 PM. Tickets can be purchased for $10 in advance here and will feature a lecture by David M. Rountree, an acclaimed paranormal investigator and author of the book PARANORMAL TECHNOLOGY. David will discuss the very latest technology and scientific techniques which are being used to try to provide explanations for and proof of the existence of ghosts and other phenomena. The evening will also feature additional noted speakers from the local paranormal community such as Tara Ciampa and Joseph Jobes from Visions Magazine Radio and paranormal investigator Gary Cangey, who has appeared on national television shows such as GHOST ADVENTURES and GHOST LAB. The evening will end with a private screening of the debut episode of GHOST STORY TV, a locally produced paranormal investigation show. “We are excited to provide a platform where members of the local paranormal community can come together to meet, to exchange ideas and to hear about the latest theories, news and techniques used by some of the most respected and creative leaders in the field of paranormal research”, says Jim Pitulski, who, along with Adam Iliff, co-founded Ghost Story TV. and his publications, please visit http://www.spinvestigations.com/. About Ghost Story TV - Ghost Story TV documents the work and findings of Ghost Story Investigations (GSI). GSI and GSTV are completely self-funded, not-for-profit endeavors wholly owned by its members. We are dedicated to gathering the most comprehensive evidence possible, and to delivering our results in a completely unbiased, professional, and sensitive manner. We continually work to improve our research methods and investigative techniques as well as to grow intellectually as learners in the paranormal field. This is captured in our motto: Seek. Think. Believe. To learn more about GSTV and GSI, visit http://www.ghoststorytv.com/. About Horror Realm - Horror Realm is Pittsburgh’s modern horror convention, with shows in March and September each year. The next convention will be held September 16-18, 2011 at the Crowne Plaza Pittsburgh South. For more information, please visit http://www.horrorrealmcon.com/. Stay tuned to Pittsburgh Underground for more information on this event and others coming soon! Hope to see you there!! !